After the stressful border crossing from Mexico to Guatemala, we were ecstatic about the four hour drive to Panajachel, our new home for the next 10 months. With our early morning start, this gave us plenty of time to get to Pana before dark. We turned our phones to airplane mode; We didn't want roaming charges in Guate because our phone plans only included Mexico. We put away the GPS; Ken decided against purchasing the Central America map package because we were told it was easy to get around with a good map. Ken pulled out the fancy, waterproof map and we were on our way. Need to transport compost? No problem. Call a taxi. We left the border and questioned every turn there after. The roads are not well marked, are full of pot holes, and have many surprise speed bumps. For the first hour we were confident enough we were on the right road. Then we entered the city of San Marcos and completely lost any indication of which road was the highway. After 15 minutes of following what we thought was the right way, we asked for help. Our limited Spanish didn't add to our charm. 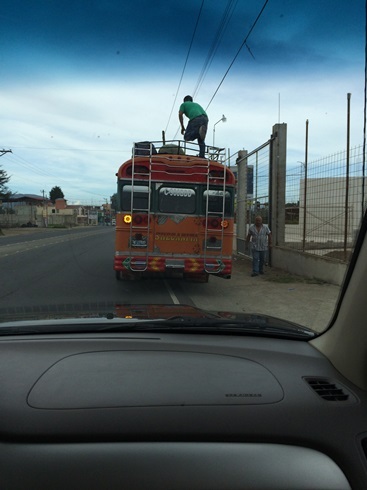 Eventually we learned we'd made it to the next town of San Pedro. Surprise, surprise! We were actually getting closer to our destination. Then we came to the big city of Quetzaltenango. Once again, our map wasn't detailed and we had no idea which roads would keep us on highway 1. We decided to follow one of the notorious chicken buses. We figured they'd probably be sticking to main roads. At one point, we hedged our bets and followed this chicken bus for about 40 minutes. When it pulled over, so did we. Eventually, they waved us on and we were on our own again. Unfortunately, it was near dusk and we needed to consider finding a hotel room in the bigger city. This would mean unloading the car and loading it again in the morning. It would also mean another day's journey ahead of us. Could we find Panajachel before dark? If we couldn't, could we find a decent hotel in a safe area? Shortly after leaving the chicken bus, we met our first Travel Angel (thank you Dave and Shelley Maurer for the term). While stopped at a gas station, we were asking an attendant which road to take to Panajachel when a shuttle bus driver appeared. He saw our car loaded with a cartop carrier and correctly assumed we were headed for the Lake Atitlan region. He invited us to follow him since he was driving to the town of Solola. Lucky for us, Solola is located above Lake Atitlan and is only a 15 minutes away from Panajachel. From our previous travels, we knew exactly how to get from Solola to Panajachel. Even if it gets dark, we would make it to Panajachel! I still feel the rush from that night. Pulling into Panajachel after 6 weeks of driving was the ultimate accomplishment. To have planned this and completed the journey with my best friend and our kids is a once in a lifetime experience. It was dark. We didn't care. We turned onto Panajachel's main tourist road and found a hotel. As Tag would say, "Boom, done!"